I stared at this a lot last night. 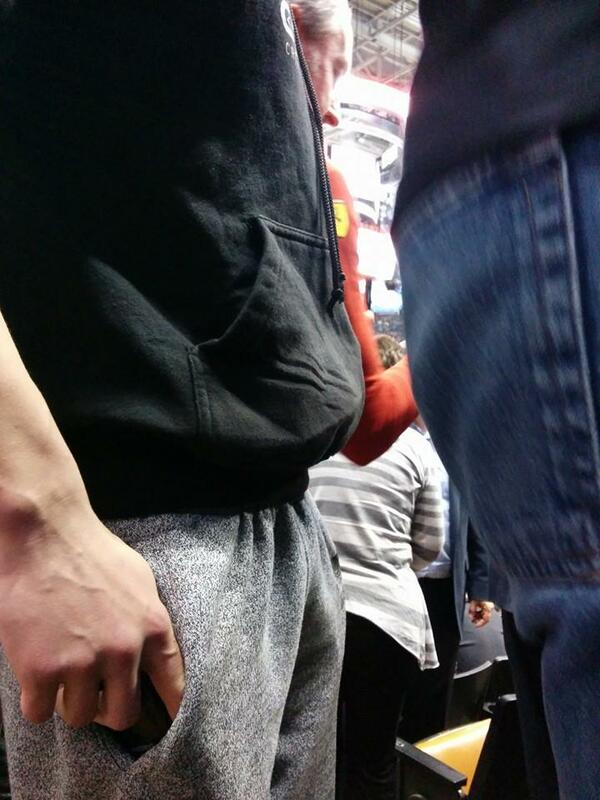 I mean, not this particular guy’s sweatpants-covered junk, but rather crowds of people all but standing on top of me. See, Nellie and I went to the Raptors game last night. We hadn’t seen one in a while, and we decided to buy good tickets. After all, it was Andrew Wiggins’ first game in Canada, and against the T-Wolves the Raps were all but guaranteed a win. They did win, but it was closer than it should have been. Anyway, we discovered when we arrived (after it took us ten minutes just to walk the last 30 feet to our seats) that his gloriousness Stephen Harper was sitting across the aisle from us. That’s his head and torso (and, uh, son) in the bottom right of the picture. The crowds that were clogging up an entire section of the ACC weren’t his entourage, they were — and I still have a hard time even believing this — people lining up to have their picture taken with him. Now, I’ll give the security guys credit: they actually tried to keep the aisle clear during play, as did the ushers. But the selfie-seekers are idiots, and would stand, gape-mouthed and blocking traffic, with Blackberries in hands until they could get a picture with that magnificent head of hair. 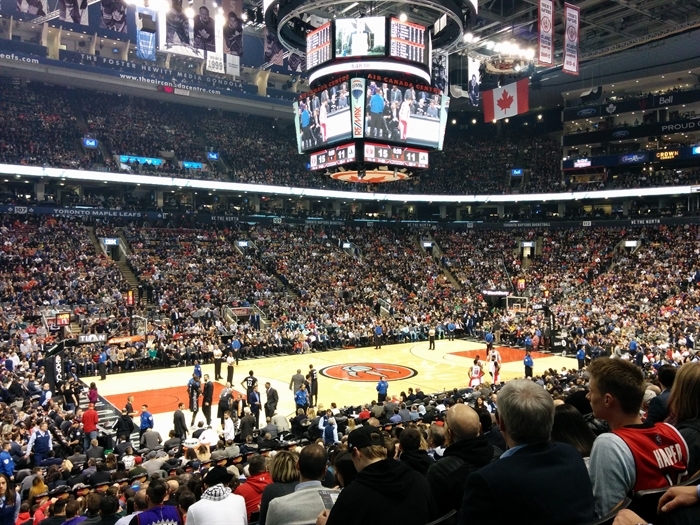 As such we couldn’t see some of the game, and missed the entirety of the half-time show and on-court entertainment, including Raptor antics which, as everyone knows, are at least 15% of the reason to attend a game. I actually felt a little bad for Harper…I think he just wanted to watch a basketball game with his kids. But then again, he decided to sit in a place which afforded maximum photo ops. Maybe he should have sat in a box where people wouldn’t bother him and where, oh I don’t know, crowds of people wouldn’t have trampled and blocked the thirty people nearest him who paid good money for their tickets. The very best part? At some point in the evening he did a photo op with some actual players, and his social media lackey tagged the wrong player. 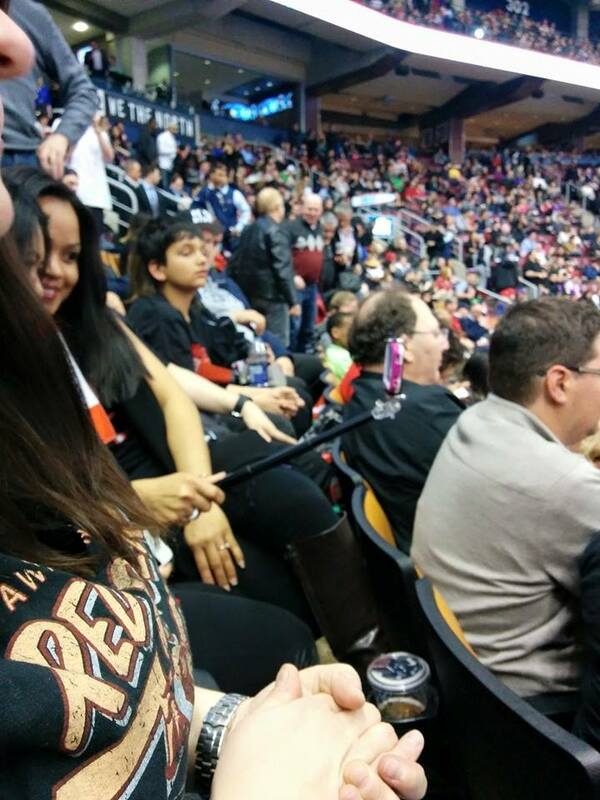 Oh, and the idiots next to us had a Wand of Narcissism, which just kind of capped off the evening. Maybe the only thing salvaging the evening was meeting up with Kaylea, Jenna, and Jordan over some pizzas at Libretto. We used beer to wash away the distaste.